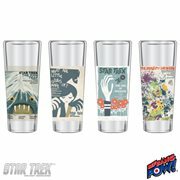 Today there are some cool new Star Trek items that have just been released. The biggest thing is Season 2 of Star Trek: The Next Generation on Blu-ray. You can order your copy from Amazon discounted to $64.99. Also released today is the Star Trek: The Original Series Soundtrack Collection from LaLaLand Records. The 15 disc set contains all the music from TOS, including music that was never used. The box costs $224.98 and can only be purchased at lalalandrecords.com. Diamond Select’s latest set of figures are just now in stores. 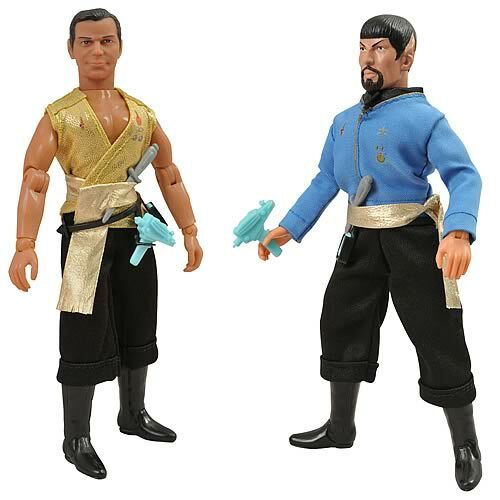 The set of Mirror Universe Retro Cloth Figures of Kirk and Spock is arriving in stores this week. The box costs $29.99 and you can order yours from Entertainment Earth. And CBS has just released version 2 of their PADD app for iPads. The new version has over 170 new entries in the database, Siri voice recognition, new Starfleet notiications, full screen photo viewing and more. Version 2 also adds iPhone and iPad mini support. You can learn more and buy the app for $4.99 at iTunes. Today there was also a new set four Retro Star Trek posters revealed by QMx. Like with previous sets, this collection of 4 prints costs $34.95. This time they take on "A Taste of Armageddon," "The Naked Time," "Arena," and "Spectre of the Gun." You can sign up for the waiting list now for mid-December delivery) at QMXonline. 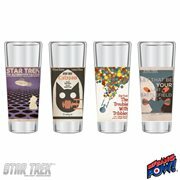 And if you like this poster series, Bif Bang Pow has announced the are turning them into Shot Glasses. 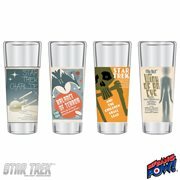 They have announced four glass sets for the first four poster releases. They are coming in April and cost $14.99 each set. You can pre-order at Entertainment Earth. And Diamond Select has just announced a Femme Fatales Seven of Nine Statue. It is nine inches tall and you can pre-order (for April release) for $39.99. And now that Season 2 is out, it is already time to start talking about Season 3. Here is a brand new promo from CBS. That Arena poster is fabulous, definitely the best one they’ve done. I wonder how they stop the Seven of Nine statue from tipping over. Wern’t the Borg supposed to be sexless….. It felt to me that the show really began to hit its stride in Season 3. Folks seemed to settle into their characters and I stopped seeing actors and starting seeing the crew of the Enterprise. I remember when BOBW ended. There was a crowd of us that got together for a potluck each week to watch the new episodes. I remember how the episode began building towards the finale, with the chorus behind the Locutus soundtrack and Picard looking so sinister. Then, Riker says that last word, “Fire!” and the music hits its crescendo. There was a moment of silence–of pure disbelief at the awesomeness that we’d just seen–and then the room exploded. There were high fives, shouts of, “No friggin’ way!” and the awful realization that we had to wait months before we found out what happened. Still gives me chills to relive it again. Hats off to all the folks behind TNG and years of really great television. Years later, it still holds up. Yes, I remember that day very well – and the growing realization, as time was running out, that they weren’t going to finish the episode. I had no idea it was going to end like that, though. I could have done with out the droning on of Jeff Bond, and his cutting off or correcting Gerald and writer David Gerald during the Q&A following the screening of Amock time. The set is very well worth the money, definately get it if you have the money to. worth every penny. I’m getting old. I still don’t understand what iPads are for. As an aside, I was just thinking that TNG may have been the show that started most other shows doing cliff-hanger season finales. Who shot JR was a few years earlier, but it seemed to really take off after TNG’s Best of Both Worlds cliff-hanger season 3 finale. I’m pretty sure ALL scripted shows end each season with a cliff hanger now. Season 2 of Next Gen is very underrated. As whole it may not be the greatest, but it has some of the series’ most compelling episodes. Its them finding their ay and beginning to gel. And as I slowly make my way through the S2 blu ray set I have to tell you it is very very worth it. The special features are outstanding and are what they should have been all along when the dvd’s were released. Can’t wait for that TOS box to arrive here. Merry Christmas to me! Looks fantastic and I’ll bet it sounds ear-bleedingly awesome. 8 No, Blake’s 7 was doing it much earlier. Woohoo! TOS Music set is on its way. The Holy Grail of Soundtracks has finally been released. I’ll wait for a Best Of collection for TNG on BluRay – there are only a handful of episodes I would like to revisit – Inner Light, Yesterday’s Enterprise among them. What’s up w/ Amazon & Best Buy online? BOTH state it will be 1.5-2 weeks before this title ships! My order even says it may not ship or arrive till Dec. 27th! But if I go locally, only 1 city near me has it at Best Buy, and 2 stores not near me at Silver Platters. C’mon man! Enough nonsense around here! Let me help you: it is a FAKE! And yes, I concede, it’s a fake. Now DS9 is a show I’m really looking forward to seeing on bluray! Hope they make it happen! Nice. Great reporting. Nice priorities. Just ordered the TOS box set. Every little note and effect ever crested for the show in one little box. Good things DO come in small packages! 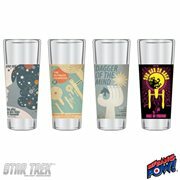 TOS set on its way to me too! Merry Christmas everyone! I would have rather had 7 of 9 as a full Borg or in a starfleet uniform, She looks better in my opinion. The silver space suit looks like something out of the first season of Lost in Space. That poster for “Spectre of the Gun” is great. Pure genius. My hat would go off to the artist, but I never wear hats. Is there anywhere I can see the reverse side of that 7 0f 9? I’m curious if the …accuracy (yeah, that’s the ticket)…if the accuracy of the statuette is consistant. Friend of mine was at the launch party at the Egyptian Theater for the TOS music CD box set last night. Said Gerald Fried was there playing experts of his original stuff from the show. Fried, an oboist, had a piano accompanist there playing with him on”Amok Time”, Finnegan’s Theme”,…others. He sent me a little clip from his phone. Would love to see the whole video of that. Can’t wait for my set to come in the mail. I haven’t got any of the TNG BluRay box sets, but I am definitely starting with Season 3. That is where TNG REALLY began for me. Seasons 1 and 2, aside for one or two episodes, were just awful and my money will not be taken from me to watch awfulness in HD. Season 2, like Season 1, is a revelation on Blu-Ray. It’s almost like you’re watching the show for the first time. I feel quite fortunate that I didn’t purchase all of TNG on DVD and that most of those were purchased used for only a few bucks a pop. The remastered TNG is the only way to watch the show from now on. Did anyone who bought the TOS soundtrack set see an estimated shipping or delivery date? All I saw was a notice about high order volume, etc. I can’t wait to get it, it’s gonna be awesome! Just ordered my CD set TOS soundtrack! Does anyone remember the Tyco Enterprises that were supposed to come out?